Image above: A pile of marine litter found scattered on a 200 m section of Sable Island’s south beach on September 16th, 2018. Debris is not uniformly distributed along the shoreline. The width, angle and orientation of the beach, as well as weather and sea state conditions, influence the localized and periodic accumulation and persistence of debris. World Cleanup Day (WCD) is a global social action program focussed on the problem of ever-increasing amounts of solid waste polluting all Earth’s environments, including the oceans. Although Sable Island is not as fouled and encrusted with beached litter as many other locations, marine debris is abundant. Since human activities and waste handling are carefully regulated on the island, almost all the trash found on the beach comes from the ocean, carried ashore by waves and winds. The north shore of Sable Island, a view towards the west. The beach looks almost pristine from a distance, but a stroll along the high tide line reveals litter freshly washed ashore as well as many items partly buried in the sand. As part of the first WCD, held on September 15th, 2018, Greenpeace Canada partnered with other organizations in Canada to conduct a Plastic Polluters Brand Audit of shorelines and green spaces. A brand audit helps with the identification of major corporations whose products contribute to the accumulations of plastic waste that are polluting inland waters and oceans. “Data collected through previous international brand audits confirmed that some of the world’s largest corporations are top contributors to single-use plastic (SUP) pollution worldwide. Many of these corporations including Coca-Cola, Pepsi, Nestle, Procter & Gamble, and others sell well-known brands in Canada.” (Ecology Action Centre). The Ecology Action Centre participated in this year’s WCD as the host of the cleanup event in Halifax on September 15th. Although on this occasion it was not possible to conduct a clean-up and survey on Sable Island consistent with the configuration of the WCD, a snapshot version of a brand audit was done on September 16th. 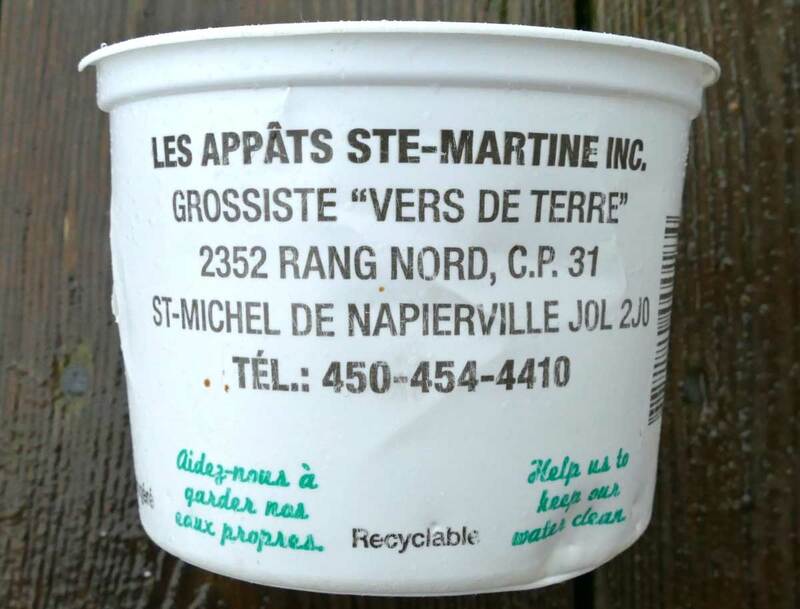 Sections of the north and south sides of the island, totalling about 15 km of shoreline, were searched for plastic containers and packaging having complete labels (i.e., providing brand name, and product and manufacturer/distributor details). 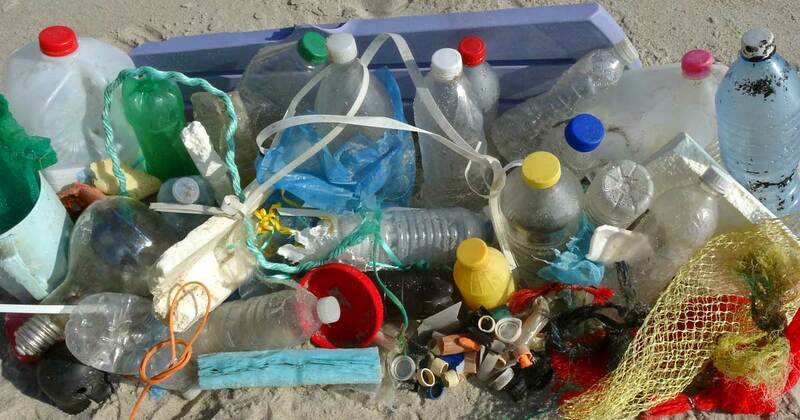 Only these items were collected, and they represented an estimated 10% of the container and packaging debris present on the beach—there were far more plastic materials on the beach that had labels damaged or missing. 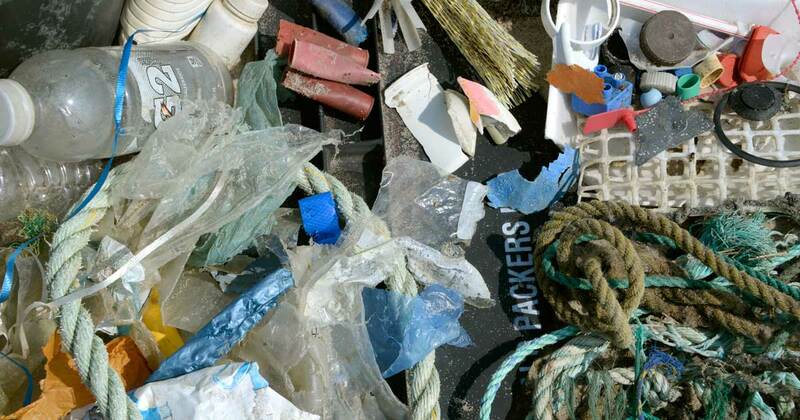 Labelled plastic items collected on Sable Island, September 16th, 2018. A plastic container for live earthworms used as fishing bait (not in commercial offshore fisheries). Based on language of labelling and details indicating where the product was manufactured or packaged, 81 (73%) items originated in Canada, 17 (15.3%) in the USA, and 13 (11.7%) in other countries including Brazil, Cuba, Haiti, Japan, Malaysia, South Africa, France and Russia. Sixty different brand names were recorded. None of the brands originating outside of Canada occurred more than once. Of the 37 brands originating in Canada, 25 occurred only once. Of the remaining 12 brands, the most common were Big 8 Spring Water (21), Gatorade (10), Powerade (5), Pepsi (4), and Coffeemate (4). 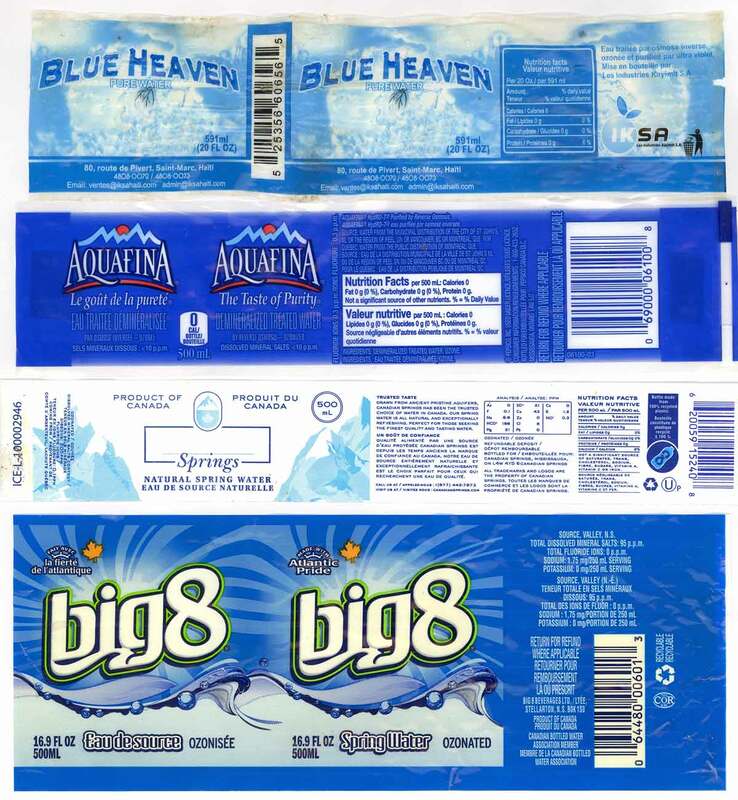 Big 8 Spring Water is manufactured by Big 8 Beverages, a Sobey’s company, based in Nova Scotia, Gatorade and Pepsi by PepsiCo, Powerade by Coca-Cola, and Coffeemate by Nestle. Three other Nestle brands were amongst the single-occurrence items: Deer Park Spring Water, Nesquik, and Boost Nutritional. Six Frito-Lay packages (various brands of potato chips) were found, and these being PepsiCo brands, bring the total of PepsiCo products to 18% of items collected. 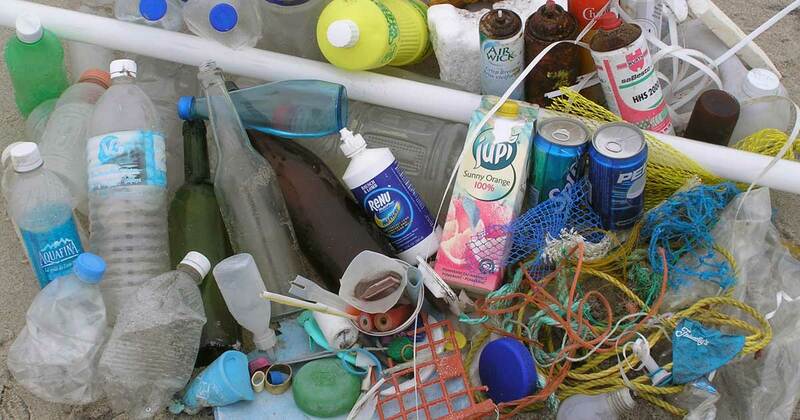 Other corporations represented by plastic packaging found during the Sable Island survey include Colgate-Palmolive, Costco, Danone, Irving, Kraft, S. C. Johnson and Son, and Shell. Of the identified types of plastic, Polyethylene Terephthalate (PET/PETE-1) was most common (66 items) because of the large proportion of beverage bottles in the sample. Other types were High Density Polyethylene HDPE-2 (14), Polypropylene PP-5 (7), and Polystyrene PS-6 (1), with 16 items of composite/multi-layered packaging (13), and single-layered packaging such as bags (3). 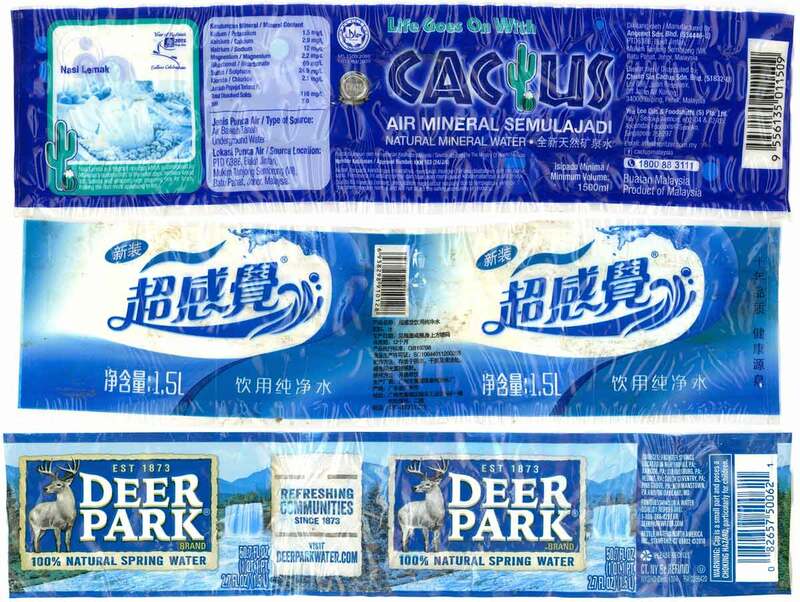 Labels of some of the water bottles found during the September 16th survey, including brands from Malaysia (Cactus Natural Mineral Water), USA (Deer Park Natural Spring Water), Haiti (Blue Heaven Pure Water), and three from Canada (Aquafina, Canadian Springs and Big 8). 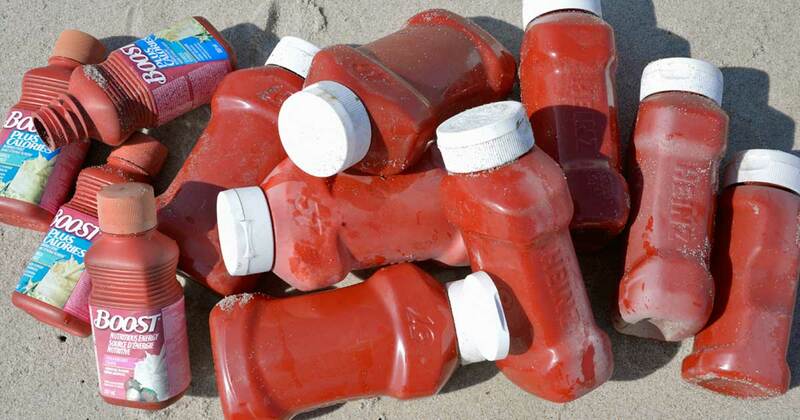 The results of the September 16th ‘snapshot’ survey provides some examples of plastic litter washed ashore on Sable Island. Although Big 8 Spring Water bottles comprised 18.9% of the total items found during the survey, this cannot be taken as an indication that this Sobey’s spring water product is a primary source of plastic water bottle debris in Scotian Shelf waters. Previous monitoring of beached litter on the island indicated that pulses of a single product more likely represent a single loss or disposal incident than a trend. A program of regular and standardized beach surveys will provide reliable information on types and sources of marine litter pollution occurring in the region. 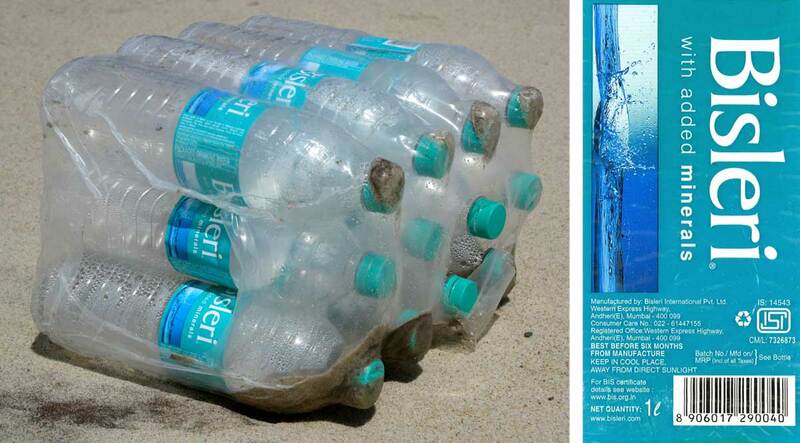 Examples of past single brand occurrences include large numbers of Boost energy drink and Heinz 57 Ketchup containers (mostly full) that washed ashore on Sable Island over a few days, and below, a dozen bottles of Bisleri mineral water (Mumbai, India) washed ashore still wrapped for shipment. The circumstances suggested that these items were the result of accidental losses of cargo or supplies, or perhaps deliberate dumping of surplus, damaged or expired products. Sable Island is an exceptional platform for monitoring trends in the Northwest Atlantic. A beached marine litter study was conducted during 1984 to 1986 (Lucas 1992), and several other litter-related projects were underway until the island became a national park in 2013. Regular surveys for oil and oiled or entangled seabirds have been conducted since 1993. 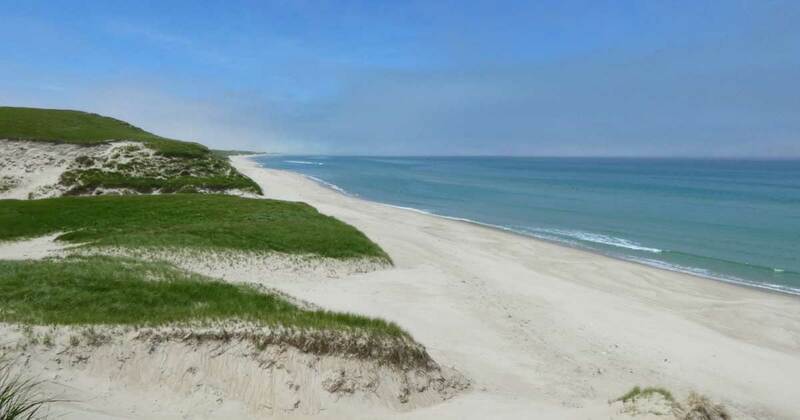 The Sable Island Institute, working with Parks Canada, will conduct a long-term program of research and monitoring that will 1) identify trends, impacts and sources of marine litter in the region, and 2) generate information that can be used to assist governments, corporations, and citizens in the development and application of solutions. The Institute’s Sable program will build on the results and experience of the earlier work, but will expand the scope and effort, and will also seek to collaborate with other organizations and synchronize programs with national and global initiatives. Several spot collections of plastic, glass and metal debris washed ashore. As noted above, although Sable Island is not as fouled with beached litter as many other locations, marine debris is abundant. 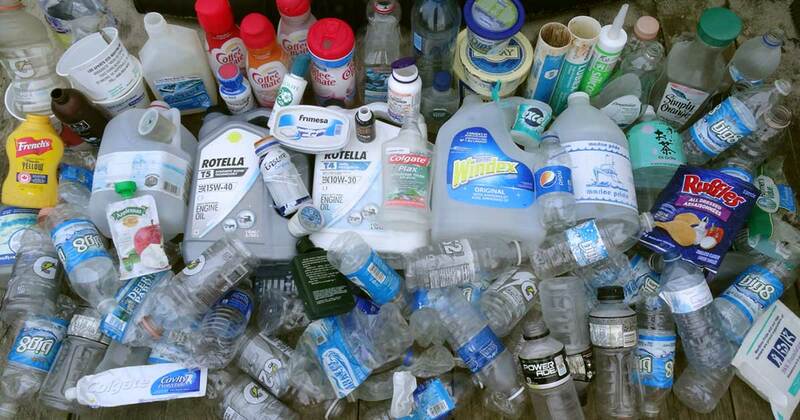 Following the September 16th survey on Sable Island, all the collected recyclable plastic items were cleaned and prepared for transport to Halifax. Although the findings of the Sable beach survey will not be included this year, the compiled results from the national and global 2018 World Cleanup Day audits will be released in early October.